I just returned from a hike out toward the new lava flow at Kalapana and it’s quite impressive. Most of the activity for the past few months has been underground. This new flow is above ground. I saw the glow on the clouds when returning home this evening and couldn’t resist going down to check it out. There were many people there with the same idea, as well. It was a good night for it as there was adequate moonlight even through the clouds. There were multiple breakouts coming down the pali and a steady stream below the breakouts. According to the Hawaiian Volcano Observatory daily report, there is “lots of surface flow on the pali and lava streams entering the ocean are producing 50 ft. explosions”. 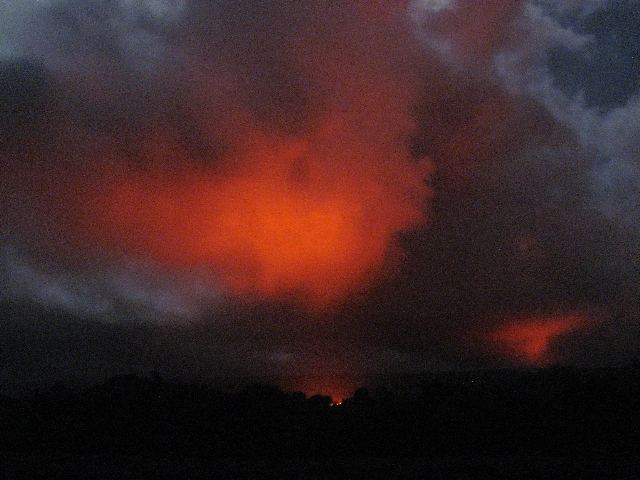 I observed the explosions boiling up as the lava hit the ocean even from where I stood about a mile or so away. I spoke with a couple who had hiked for an hour out toward the lava stream and never reached it. Remember, it always looks closer than it is. They said it was like a “river” coming down. Another person I spoke to said she hiked out long enough to “feel the heat”, likely standing on a skylight over a previous, recent flow since the current one is above ground, and she turned around and hiked back. Usually the flow will harden and produce a tube to flow faster into the ocean. Hopefully it will stay on the surface long enough to light up the clouds for a few more nights. I remind my readers that the lava flow area at Kalapana is to be respected. A weak wind was blowing from a southeasterly direction tonight so it was blowing fumes away. Never venture in that area if the winds are coming from the west or northwest as the fumes are toxic. A good rule of thumb is that you should feel the wind on your back when walking from the parking area toward the viewing area/flow. In addition, you never know where the lava might be flowing underneath where you are hiking so be cautious. This is the reason the county sets up a safe viewing area. Lava viewing hours in this area are from 5pm to 8pm daily. They close this area at 10pm. Wear good shoes, bring a flashlight and drinking water and be prepared to be “wowed”! 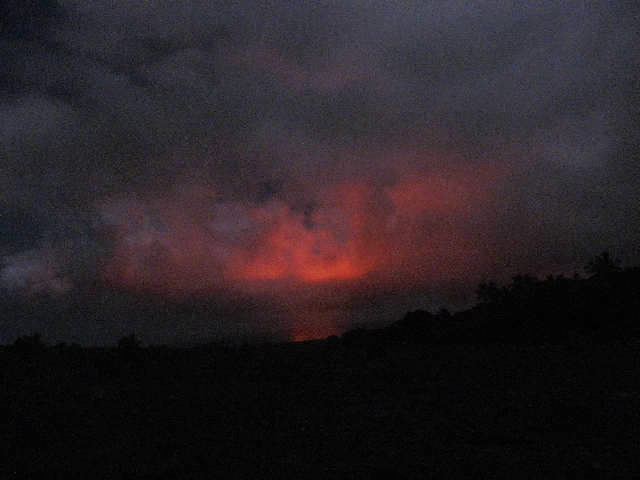 A very active, sloshing lava surface has been visible via webcam within a single opening at the bottom of a deep pit inset within the floor of Halema`uma`u Crater; overnight, the surface continued to rise out of the opening and cover the pit bottom before falling back into the opening; the lava surface reached the highest lava levels in the pit in the last several days. 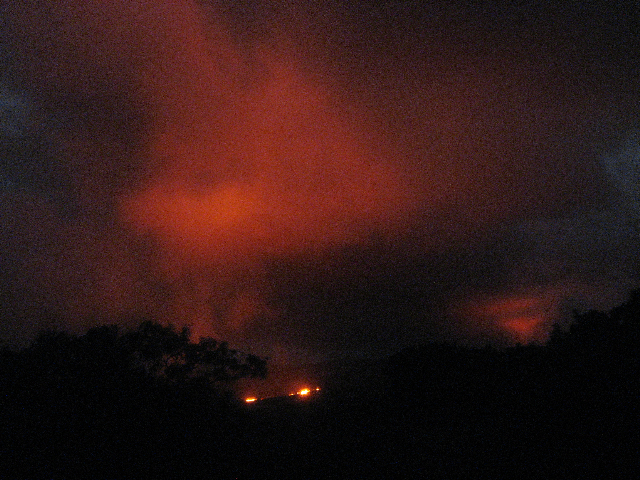 The strongest glow since the end of June, 2009, was visible from the Jaggar Museum Overlook and in the Halema`uma`u webcam overnight. All comments are appreciated and I will update as possible.